It's your last chance to hide. Till your long last ride. It's your last chance of nothing. It's the Last Chance Saloon! 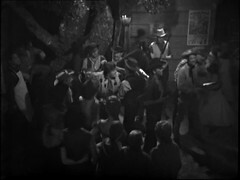 Doc Holliday's girlfriend Kate distracts the gunmen allowing the Doctor to enter safely. He tries to convince them he's not Holliday but they don't believe him. Kate shoots at them, making them believe it was "Doc Holliday". Local lawmen Wyatt Earp and Bat Masterson arrest the Doctor and put him in jail. Steven wants to break the Doctor out of jail: the Clantons initially agree to help wanting their revenge on him. Dodo meanwhile is playing cards with Kate & Holliday. Steven comes to rescue the Doctor but the Doctor won't go along with the plan and turns the gun Steven's bought him over to Earp. The Clintons' change their plan, rouse a mob and capture Steven. Holliday shoots Seth Harper while trying to leave the saloon with Kate & Dodo. The Clantons bring the bound Steven to the jail demanding the Doctor's release to them or they'll lynch Steven in his place. You know what, I'm really enjoying this. It might be a bit of fun that certain Doctor Who fans hate but it's a bit of fun that's amusing me. "The Ballad of the Last Chance Saloon", used instead of incidental music in this serial is getting rather annoying. But if you listen closely to the lyrics you'll find it's summarising and narrating the story. The title of this episode is apparently sourced from a notice in a saloon in Leadville, Colorado that Oscar Wilde saw during his 1883 US Tour, two years after this episode was set. DOCTOR: Oh, really? Why? Oh, yes, of course. We met a little while ago down at the dentist. Yes, and you so very kindly invited me to join you and your friends for a drink! HARPER: And a little talk, Doc. DOCTOR: Yes, quite so, quite so. Well, I'm afraid I don't touch alcohol, but a little glass of milk and I should be only too delighted. Now I've seen several people claim that the Doctor doesn't drink alcohol, or eat meat for that matter, and wondered what the origin of that earlier claim was. The claim is clearly rubbish, as Day of the Daleks amongst others shows! The "not eating meat" aspect probably comes from the Doctor's decision to go Vegetarian following the events of The Two Doctors though I believe there's plenty of evidence before that that he did eat meat! DOCTOR: I have no intention of trying anything, only people keep giving me guns and do I wish they wouldn't. The director of this story is Rex Tucker, who was initially attached to Doctor Who as a producer before Verity Lambert was brought in. He initially hoped that his daughter Jane would sing "The Ballad of The Last Chance Saloon", but reportedly her voice lacked presence so Lynda Barron, later to find fame in sitcoms and appear as Captain Wrack in Enlightenment, was hired to sing instead. Jane Tucker does appear as an extra in this serial, I've never spotted her but she's down on IMDB as playing a Settler's Daughter so I guess she's seen in the crowd scenes in this episode and the next. Jane Tucker is the Jane of Rod, Jane & Freddy, previously Rod, Jane and Matthew. if you want to find out who Matthew is, and he is someone you'll have heard of, then come back for the Daemons when he makes his Doctor Who appearance! Doc Holliday is played by Anthony Jacobs. He brought his young son Matthew along to the set during recording. Matthew Jacobs would go on to write the 1996 Paul McGann Doctor Who TV Movie and be heard interviewed in Toby Hadoke's Who's Round #43. Derek Chafer was, all uncredited, a Saxon in The Meddling Monk and a Saxon warrior in Checkmate, the 2nd and 4th episodes of The Time Meddler, a Greek Greek Soldier in Temple of Secrets, Death of a Spy & Horse of Destruction, episodes 1, 3 & 4 of The Myth Makers and a Guard in Bell of Doom, the final episode of the Massacre. He'll be back as a Cyberman first in The Moonbase episodes 3 & 4 and again in The Invasion episode 6 where he gets his only credit but also gets his surname misspelt with an extra F! He's an Extra in The Space Pirates episodes 4 & 5, a UNIT Soldier in Doctor Who and the Silurians episode 3, a Prisoner in The Mind of Evil episode four, a Guard in The Curse of Peladon episode one, an Exxilon in Death to the Daleks parts one to three, a Guard in The Monster of Peladon part one, giving him both Peladon stories, and finally an Armourer in The Masque of Mandragora part four. 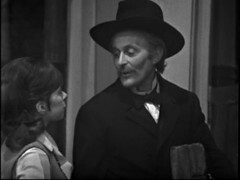 Nobody beats Reg Cranfield's record for an earlier appearance in Doctor Who: he's the Policeman at the start of An Unearthly Child and returned as a Parisian Man in The Massacre episode 1 War of God. His sole appearance after this episode is as a UNIT Soldier in Doctor Who and the Silurians episode 3. He appears in Script Editor Gerry Davis' Doomwatch as a Man in Spectre at the Feast then again in The Islanders. 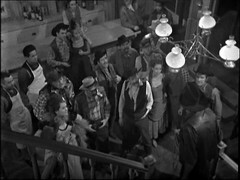 Mark Allington, like Richard Beale (Bat Masterson) and John Caesar (Cowboy) was also in the Ark but he was an uncredited Guardian in the first two episode. Many years later he returns as a Man in Market in Snakedance part one. He's got a Blake's 7 to his name playing a Star One Technician in Star One. John De Marco returns once in The War Games: Episode Eight as a Mexican Bandit but he too was in Doomwatch, long overdue for a proper DVD release, as a Lab Assistant in The Plastic Eaters and a Passenger in First Plane. 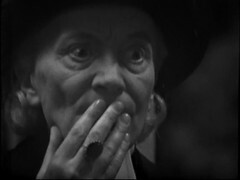 It's a last Doctor who appearance for Marguerite Young as the Settler's Wife who was previously in The Massacre episode 3 Priest of Death as a Parisian Woman and also for Kevin Leslie, another Lynch Mob Member, who'd been in Dalek Masterplan 9: Golden Death as an Egyptian Warrior. Leslie later pops up in the Inspector Morse episode Promised Land as a Barman, not the only Doctor Who actor to fulfil this function in that series! Maureen Lane (any relation to Jackie?) is the Brassy Bar Girl and she reappears as a Drum Majorette in episodes 1 & 4 of The Macra Terror. Les Shannon, another Lynch Mob Member, was also in Massacre 3: Priest of Death but as a Council Member and he'll be back as an uncredited extra in Doctor Who and the Silurians: Episode 6. He's got Blake's 7 to his name too as a Federation Trooper in the first episode The Way Back and a Kairos Guard in The Harvest of Kairos. He was in the cult classic Out of the Unknown, which has now been released on DVD, in one of the sadly missing episode The Sons and Daughters of Tomorrow as the Coroner, and Moonbase 3 as Technician in View of a Dead Planet. Maureen Nelson, another Brassy Bar Girl, was another Moonbase 3 technician in both Behemoth & Outsiders, was in the same Doomwatch episode as Reg Cranfield, The Islanders, as a Woman and also has a Survivors credit to her name as a woman in Corn Dolly! That's virtually the entire gamut of UK Telefantasy covered by the guest cast and extras of one Doctor Who episode!